Ronda Rousey went on social media and sent a message to WWE after last night's incident on RAW. As noted, Rousey and husband Travis Browne dropped a few security guards after her squash win over Dana Brooke. 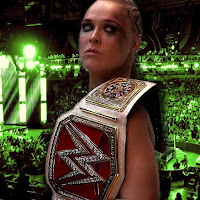 The announcers wondered if Rousey would suffer another storyline fine like the one she received last week. Rousey wrote, @wwe can fire me whenever they want. I’ll gladly go home and live happily ever after with the love of my life @travisbrownemma. They can’t control me with this job. @wwe can assign as many security they want to follow me, they can’t control me with hired goons. @wwe can go ahead and fine me however much they want. They can’t control me with money. You’re all lucky my husband @travisbrownemma was there to stop me when I was just getting started. Now that he’s been banned from #Raw, your luck has run out.